Linlithgow kayakers have been selected to compete in major championships at under 23 and junior level this summer. British Canoeing has picked Lewis Fletcher (Linlithgow KR) for next week’s World Championships at Montemor-O-Velho, Portugal (July 23-26). He will compete at under 23 level in the K2 (two man kayak) at 200m with England’s Matthew Robinson. Lewis and Linlithgow siblings Sean and Amy Redmond will also compete in the European Championships in Bascov in Romania from September 17-20. Sean will compete in the K4 (four man kayak) over 1000m at under 23 level, Amy in the K2 1000 at under 18 level. All three are part of the SCA (Scottish Canoeing Association) performance programme and train at Ratho. At last weekend’s national regatta in Nottingham, which also incorporated the GB Junior Sprint Championships, Linlithgow had 14 paddlers and came back with four GB champions and a total of 21 medals, 10 of which were gold. Other local paddlers Oliver Bohle and Emma Brockway (both Linlithgow CC) have been selected for the Olympics Hopes regatta in Bydgoszcz, Poland (September 25-27). Oliver is a four time under 16 boys’ GB champion, in the individual K1 200m and K2 over 200, 500 and 1000m. Emma is also a four times under 16 girls GB champion in the K2 over 200m, 500m and 1000m and the K4 over 500m. 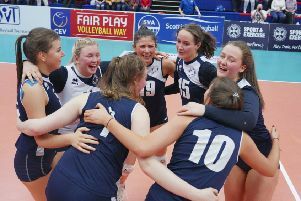 Scottish Canoeing Association performance director Remi Gaspard said: “We certainly knew our athletes had the potential to be selected for these championships. ‘‘The good thing is that they all delivered when it mattered last weekend at the national championships. “For us the great thing is that of the 14 athletes on our performance programme, we expect 10 of them to compete in a GB vest this summer.